Former FDA commissioner Scott Gottlieb wanted nicotine in cigarettes reduced to minimally or non-addictive levels. Gottlieb also began a crackdown on select e-cigarette products. Investors in tobacco stocks need to think about whether or not a crackdown on e-cigarettes is actually good news. Investors in tobacco stocks also need to consider if the next FDA commissioner will be as aggressive as the last one. In September 2018, the US Food and Drug Administration's (FDA) crackdown on e-cigarettes was met by a rally in Big Tobacco stocks. I find this odd because looking further ahead, electronic nicotine delivery systems (ENDS) including e-cigarettes are a potential life raft for Big Tobacco should revenues from conventional tobacco products decline. Indeed, a sharp decline in US revenues from conventional tobacco products could occur if the FDA were successful in implementing some of its more aggressive policies, such as reducing the amount of nicotine in cigarettes to render them minimally- or non- addictive. Perhaps in acknowledgement of this is Big Tobacco's marketing of its own e-cigarette products, development of heat-not-burn tobacco products like British American Tobacco's (BTI) glo, and investments in the e-cigarette industry, such as Altria Group's (MO) $12.8B investment in privately held JUUL Labs (JUUL). September 2018 was not an isolated event, however; recent years have seen increasing regulation of both the e-cigarette industry and Big Tobacco under the leadership of FDA commissioner Scott Gottlieb, which is the first focus of this article. Many of Gottlieb's biggest ideas to regulate the industry, however, are not yet laws. The recent exit of Gottlieb from the FDA leaves us with the question of what his successors will do with his proposals, which is the second focus of this article. On March 5, 2019, US Food and Drug Administration (FDA) commissioner Scott Gottlieb announced his resignation, effective in one month. Gottlieb apparently wished to spend more time with his family. However, some have noted the timing of Gottlieb's departure "seems odd" given some of the moves Gottlieb was making (Table 1), which were likely adversely impacting Big Tobacco and e-cigarette manufacturers. Table 1: Timeline of Gottlieb's actions relating to nicotine during his time as FDA commissioner. Source: Relevant press releases cited in the table. March 2017 Gottlieb is nominated as FDA commissioner. May 2017 Gottlieb is confirmed by the Senate. June 2017 The FDA issues a statement from Gottlieb on the 2016 National Youth Survey results. Gottlieb is encouraged by declining youth tobacco use but notes youth are using alternative tobacco products. The FDA issues a statement noting it "plans to begin a public dialogue about lowering nicotine levels in combustible cigarettes to non-addictive levels through achievable product standards." Shares of tobacco stocks are hit hard, MO is down ~19% at one point, the largest drop within a session in 18 years. The deadline for marketing applications on e-cigarettes is extended to August 8, 2022, allowing their continued marketing in the interim, note that this applies to deemed products that were on the market as of August 8, 2016. The FDA announces its plans for a new public health education campaign to discourage e-cigarette and other ENDS use by kids. The FDA announces the "Every Try Counts" campaign with messages highlighting the benefit of quitting smoking to be displayed at the point of sale of tobacco (such as at gas stations and convenience stores). The FDA issues an advanced notice of proposed rulemaking (ANPRM). The ANPRM includes new product standards that would lower nicotine in cigarettes to levels so low that they would be potentially rendered nonaddictive. The FDA also announces it is issuing an ANPRM seeking information about how flavors may cause youth to initiate tobacco use or help adults reduce cigarette use/switch to potentially less harmful nicotine products. The FDA releases a statement from Gottlieb who notes the FDA has sent out 40 warning letters to retailers because of youth sales of JUUL e-cigarettes. The FDA also takes new action to examine the youth appeal of JUUL, including sending a request for information to JUUL Labs. The FDA and the Federal Trade Commission (FTC) warn manufacturers, retailers and distributors about the sale of e-liquids that are labelled/advertised so that they resemble kids food products like juice boxes or candy. "If you target kids, then we’re going to target you," says Gottlieb. Figure 1: An example of an offending e-liquids. Source: FDA website. The FDA starts sending more requests for information to other e-cigarette manufacturers, similar to the request it sent to JUUL Labs. Gottlieb comments on the 2017 National Youth Tobacco Survey results, saying more must be done to address youth use of e-cigarettes. Gottlieb notes the FDA is developing policies regarding the development of alternative forms of nicotine replacement therapy including e-cigarettes. These alternative forms, however, would be regulated like drugs and would have to undergo preclinical and clinical testing. The FDA notes it has issued more than 1,300 warning letters and fines as part of a blitz over the summer on retailers illegally selling JUUL and other e-cigarettes to minors. "We cannot allow a whole new generation to become addicted to nicotine," says Gottlieb. The FDA also sends letters to the makers of JUUL e-cigarettes, Vuse (Reynolds American), MarkTen XL (MO), blu e-cigs (Fontem Ventures) and Logic (Japan Tobacco International USA), asking each company to submit plans within 60 days on how they plan to address youth access and use of their e-cigarettes. Gottlieb also refers to e-cigarette use among youth as an "epidemic." The FDA launches "The Real Cost" Youth E-Cigarette Prevention Campaign with advertisements on social media sites and in high schools to educate kids about the dangers of e-cigarettes. The FDA's crackdown on the e-cigarette industry continues as the agency sends letters to another 21 e-cigarette companies seeking to determine if e-cigarettes are being illegally marketed. The FDA also conducts a surprise inspection of JUUL and seizes over 1000 pages of documents. Senators Durbin (D-Illinois) and Murkowski (R-Alaska) write to Gottlieb, alleging the FDA has knowingly allowed kid-friendly e-liquids to proliferate, which has driven the youth e-cigarette epidemic. The letter also lauds recent FDA action to combat youth e-cigarette use but requests more be done by banning kid-friendly e-cigarette flavorings. Gottlieb notes he has met with leadership from MO, JUUL, Reynolds American, Fontem Ventures and Japan Tobacco International USA. The meetings are referred to as constructive and the companies in question acknowledged the issue of youth use of tobacco products. The FDA and Centers for Disease Control and Prevention (CDC) note data showing a sharp uptick in e-cigarette use in youth from 2017 to 2018. Gottlieb writes to the CEO of JUUL and the CEO of MO to request a meeting. Gottlieb notes that since MO took a stake in JUUL, "many of JUUL's public statements seem inconsistent with its previous representations to the FDA." Those earlier statements appear to have concerned JUUL and MO's acknowledgement of the youth tobacco use epidemic and the steps each would take to address the epidemic. The FDA continues to support the development of alternative forms of nicotine replacement therapy such as ENDS including e-cigarettes, issuing draft guidance on how to conduct clinical testing of these products. The FDA requests $6.1B from the President's FY2020 budget. Advancing regulation of ENDS including e-cigarettes is named as a key reason as to why increased funds will be required. The press release also notes the FDA has commissioned studies to look at the potential harm of e-cigarettes including changes which could be a precursor to cancer. The FDA moves forward the deadline for premarket applications pertaining to flavored ENDS products (other than mint, tobacco or menthol). The deadline is now August 8, 2021, a year earlier than prior. The agency also takes actions which would end the marketing of some flavored cigars. Gottlieb and his deputy, Amy Abernethy, discuss reports of e-cigarette users having seizures, noting that it isn't clear if there is a direct relationship. The FDA notifies the public via a special announcement. On April 8, Norman E. Sharpless takes the wheel as acting FDA commissioner. Gottlieb's exit was perceived as a positive for Big Tobacco, but given the trends in e-cigarette use noted towards the end of 2018 (Figure 2), it seems quite possible the next FDA commissioner would be compelled to act. Figure 2: Data from the National Youth Tobacco Survey, United States, 2011-2018, showing current (≥1 day in past 30 days) e-cigarette and any tobacco product (includes cigarettes, cigars, smokeless tobacco, e-cigarettes, hookahs, tobacco pipes, snus, dissolvable tobacco and bidis) use among middle and high school students. Note that e-cigarette use has increased so much that use of any tobacco product is now higher than 2011. Source: Figure presented in Cullen et al., Morb Mortal Wkly Rep, 2018, 67:1276-1277. The question then becomes just how aggressive the next FDA commissioner will be in pursuing a reduction in youth use of e-cigarettes. A second question is whether Gottlieb's proposal to reduce nicotine in cigarettes to non-addictive levels will remain just as a proposal or something future FDA commissioners will take further. A new era at the FDA? As of April 8, 2019, Norman E. Sharpless, previously director of the National Cancer Institute, has stepped in as acting commissioner. While Gottlieb apparently recommended Sharpless be given the role permanently, it seems that Sharpless is a Democrat, not a Republican. A permanent commissioner must be nominated by President Trump (the Trump administration did in fact name Sharpless as acting director) but Senate confirmation is also required. It isn't clear if Trump would actually stick with Sharpless going forward. Even if Sharpless didn't hang around, he could still pursue increased regulation of tobacco products during his time as commissioner. According to Health and Human Services (HHS) Secretary Alex Azar "There will be no let-up in the agency’s focus, from ongoing efforts on drug approvals and combating the opioid crisis to modernizing food safety and addressing the rapid rise in youth use of e-cigarettes." I also wouldn't be surprised to see that the head of a cancer institute wasn't entirely supportive of the tobacco industry. Indeed, following the announcement of Sharpless as acting commissioner, MO, PM and BTI all fell, although each closed down less than one percent. Also, Sharpless previously spoke in support of the FDA's move to address e-cigarette use in kids. Further, while Gottlieb is gone, some of the same senators that put pressure on him to regulate e-cigarettes (October 2018, Table 1) are already putting pressure on Sharpless to do the same. Incoming Acting FDA Commissioner [Dr. Ned] Sharpless must, on day one, work to protect our nation’s children from a lifetime of nicotine addiction by putting the full force of FDA behind this effort. - Statement from Senator Durbin. Investors in Big Tobacco then might be hoping Sharpless doesn't hang around too long. Some potential permanent replacements for Gottlieb include Amy Abernethy, currently the principal deputy administrator at the FDA, and Brett Giroir, currently the HHS Assistant Secretary of Health. Regarding Abernethy, she is an oncologist and served as Chief Medical Officer of cancer data company Flatiron which was acquired by Roche (OTCQX:RHHBY) in 2018. Given Abernethy's experience in palliative care oncology, she has likely witnessed those with smoking-related terminal illnesses and had to deliver bad news to their loved ones and witness their reaction. I would imagine she would continue the work of Gottlieb were she appointed commissioner. Brett Giroir, on the other hand, has a background as a pediatric critical care physician, which makes me think he wouldn't be too keen on the rise of e-cigarette use among teenagers. Giroir has also taken on a number of roles within academia during his career, such as vice chancellor for research at the Texas A&M University system, but also in industry as President and CEO of ViraCyte. Lastly, Giroir has experience in government roles, having held positions at Defense Advanced Research Projects Agency (DARPA) for several years during the 2000s and more recently at HHS. During his time at HHS, Giroir has been involved in tackling the opioid epidemic, as Gottlieb has been during his time at the FDA (it is a multi-agency effort). While I'm confident Giroir would continue to work on addressing the opioid epidemic with the same zeal that Gottlieb has, it isn't clear if the same would be true with regards to increased regulation of Big Tobacco. What about Gottlieb's proposal to reduce nicotine content of cigarettes? Overall, while I think senators will keep pressure on Sharpless and the eventual permanent FDA commissioner to continue cracking down on e-cigarette use by youth, it isn't clear what will happen to Gottlieb's proposal to reduce nicotine in cigarettes. What is slightly more clear is the potential impact such policy could have. The projections speak for themselves, and while they are merely projections the idea that a switch from cigarettes to non-combusted tobacco use (such as e-cigarettes) would occur is hardly counter-intuitive. Figure 3: The projected change in tobacco use among adults in the US if policy were put in place that set a maximum level of nicotine in cigarettes thus making them minimally addictive. 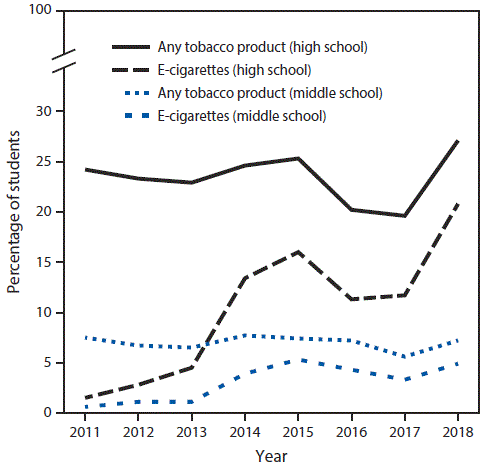 The dashed blue line represents a baseline scenario based on current trends (where a policy regulating the maximum level of nicotine is not in place). The grey area represents a potential 5th to 95th percentile range on the effect of implementing the policy, the solid black line represents the median projected prevalence of tobacco use if the policy were implemented. Note the initial sharp drop in prevalence, even in panel D, were the policy to be implemented. Source: Apelberg et al., N Engl J Med, 2018, 378:1725-1733. Based on these projections, and a bit of common sense, a potential strategy for Big Tobacco to prepare for this policy is to increase its exposure to ENDS. Many of the players in the space are already doing this. While MO's MarkTen e-vapor products were recently discontinued, the company has US commercialization rights to IQOS, a heat-not-burn tobacco product from Philip Morris International (PM). PM and MO are still awaiting decisions from the FDA on their pre-market tobacco product application and modified risk tobacco product application. I don't like PM and MO's chances on claims of modified risk, given that research continues to suggest that heat-not-burn tobacco products are potentially harmful. Still, IQOS has had success for PM ex-US, and so if approved in the US, it might become a substantial revenue stream for MO. Similarly, Japan Tobacco (OTCPK:JAPAF, OTCPK:JAPAY) is intensifying their efforts in the heat-not-burn space with the launch of new devices in Japan in an aim to catch up with sales of PM's IQOS (71.8 percent share of the heat-not-burn market in Japan in 2018), or at least BTI's glo (20.1 percent). In the US, however, JAPAF's efforts with regards to heat-not-burn products seem minor, and aren't even mentioned in a 2019 business plan. JAPAF's US vaping product line Logic doesn't have the hold on the US vaping market that JUUL has and so JAPAF really needs to expand the range of ENDS it offers in the US to protect against the potential policy change regarding nicotine levels in cigarettes. Considering the importance of the US market to the tobacco industry, trends in US nicotine consumption and the potential for restrictive regulation on sales of tobacco products, the actions of the next FDA commissioner have the industry at a major turning point. If the FDA sinks the life raft (ENDS) and the ship itself (conventional tobacco products) begins to sink too, then things don't look so good for Big Tobacco's US revenues. Another commissioner like Gottlieb could see US revenues and prospects fall sharply, the next generation in the US simply might consume less nicotine! On the other hand, a more permissive commissioner might facilitate a move from cigarettes to various kinds of e-cigarettes, meaning the next generation continues to consume plenty of nicotine, just in a different form. There are no clear signals on what Sharpless will do with regards to other ENDS like IQOS or glo, nor on whether or not Gottlieb's proposal to reduce the nicotine content of cigarettes will become a reality. I believe during the first few months of Sharpless' tenure as acting commissioner, he will put out statements signalling his intent to continue Gottlieb's work on e-cigarettes and reducing youth tobacco use. Given MO is now so exposed to the industry via its JUUL investment, I believe MO would trade down on that news. It is unclear if the market will wake up and realize the rest of the tobacco industry needs vaping too. In closing, I want to make it clear that this article has mainly looked at the potential impact of FDA regulation on the tobacco industry. Other material factors which might influence decisions on a long or short in tobacco stocks were not discussed. For example, strong Q1 '19 earnings could offset downside seen due to increased regulation, or threats of regulation, of the tobacco or e-cigarette industry.